Ministry Ideaz: Save with Bundled packages! The 2016 “Remain Loyal to Jehovah!” convention is just around the corner, and it's important you take the time to prepare so that you can make the most of the event. You have likely heard of our custom notebooks, pens and activity books, but now you have the opportunity to take advantage of our bundle deal. 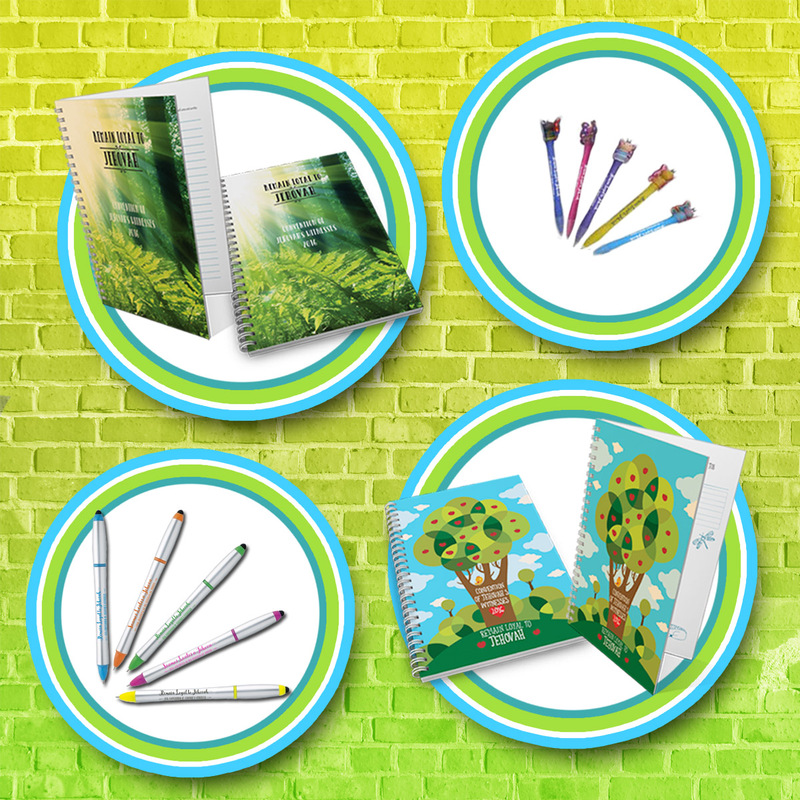 For a limited time, you can get 20 spiral notebooks, 20 highlighters, 10 workbooks for children and 10 butterfly pens, and by ordering our bundle package, you will save more than $100 on convention supplies. Whether you are ordering for a group or want to give extra supplies to friends and family, you don’t want to miss out on this great deal. These spiral notebooks are designed for the 2016 “Remain Loyal to Jehovah!” convention, and with 58 pages, you will have plenty of space to jot down key points and any information relevant to you, and to help you save time, the subject of each talk is already printed within the notebook. Not only are these notebooks ideal for remembering key points, but they also make great keepsakes. With a glossy finish and high-quality paper, they will last for years to come. The 2016 “Remain Loyal to Jehovah!” convention is going to offer a lot of valuable information about maintaining a strong faith in Jehovah and about teaching others his word. When attending the convention, you and your group will need to take notes and highlight important Bible passages so that you can refer to them as needed. These multipurpose tools act as both a pen and a highlighter so that you are not required to carry a bunch of items around. Because these pens are engraved, they make great souvenirs and can be used for years to come. It can be hard to keep children entertained and engaged during a three-day convention, which is why our bundle package includes both activity books and butterfly pens for children. With these books, children will have fun as they follow along with the talks, and they will enjoy the various activities. As they work through their activities, children will learn the importance of love, the value of forgiveness and the power of faith. Feeling engaged and inspired, children will walk away from the convention with an enhanced understanding of Jehovah and the importance of following his word. UrgentEssayWriting.com is using kinda similar stuff if their customers have given the task to them to highlight important places in the essays they are writing.